Dortmund - Borussia Dortmund bid their coach Jürgen Klopp farewell in style by beating SV Werder Bremen 3-2 and securing a place in the UEFA Europa League next season. Goals from Shinji Kagawa, Pierre-Emerick Aubameyang and Henrikh Mkhitaryan were enough to give Borussia the points, with Levin Öztunali and Theodor Gebre Selassie replying for the visiting team. The result ensures that BVB will need to negotiate a Europa League qualifying round in 2015/16, but they can still bi-pass that by winning next week's DFB Cup against VfL Wolfsburg. Klopp's seven-year reign - one of the most successful in Dortmund's history - could not come to an end without the fans preparing a spectacular send-off, and so it was that the charismatic coach had to fight back the tears as the supporters bade him farewell with a spectacular fan choreography before kick-off. The players clearly wanted to give the 47-year-old a fitting send-off too and they started strongly, with Aubameyang hitting the post before Kagawa gave them an early lead from Ilkay Gündogan's assist. Aubameyang then made it 2-0 within two minutes, providing a cool finish to Kagawa's pass. Dortmund were sure of their place in Europe as things stood, but Bremen looked to wrestle that back from them, with Öztunali bringing them back into the game by converting confidently from Zlatko Junuzovic's pass. The away side then wasted good chances to level, and they were punished when Mkhitaryan's delightful lob over Koen Casteels restored the hosts' two-goal advantage just before half-time. The home side were unprepared to settle for that, however, as they stormed out for the second half, with Reus threatening twice before Aubameyang sent a shot just over the crossbar. Mkhitaryan then went even closer still by striking the frame of the goal, before the effervescent Aubameyang passed up another presentable opportunity to make it four. With the points seemingly in the bag, and next weekend's final against Wolfsburg to think about, Klopp began to make changes to his side, withdrawing both Reus and Kagawa. Bremen were not done yet, though, and Gebre Selassie brought them back into the game. Again Junuzovic was the provider, this time with a free-kick that the Czech Republic international touched into the net. There was still time for an ovation as veteran midfielder Sebastian Kehl left the field after his final Bundesliga game as a professional, followed by more cheers moments later at the final whistle and, finally, the loudest applause of all for Dortmund's outgoing and enduringly popular coach. 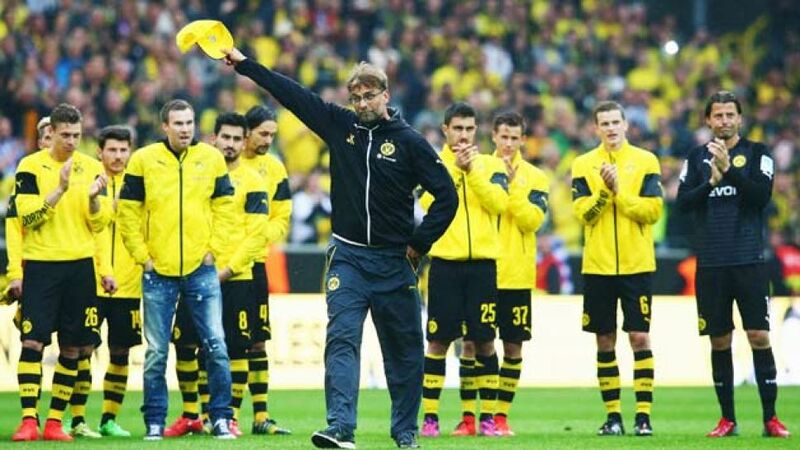 See Klopp bidding the Signal Iduna Park faithful goodbye in this video, courtesy of the Bundesliga's official YouTube channel.